The famous Swiss watch company Bovet has introduced a novelty - an original Tourbillon Grande Date 5-Day Reversed watch, completed Grandes Complications collection. The watch case is made of 18 carat white or red gold. Its main feature is a form of constructive Amadeo ® Convertible, allowing transforming it into a watch or a table clock or a pocket watch. The case of the novelty in the diameter reaches of 44 mm, water-resistant - 30 meters. The crown with a blue sapphire cabochon is located at 12 o’clock position. Front and back side of the model - sapphire crystal with anti-reflective coating. The basis of the watch is skeletonized manufactory mechanism 14BM01AI in diameter of 33 mm and a thickness of 8.85 mm on the basis of 49 jewels, 14 ½ lines, the frequency of the balance of 21,600 vibrations per hour (4 Hz) and 5-day power reserve. The mechanism provides an indication of the hours and minutes at the decentralized dial black with gold hour indices and the central hands, which are located on the front side of the case through the snake-typed blued central hands, located at the back side of the case. Indication of seconds occurs through three snake-typed blued central hands on the tourbillon carriage at the 3 o’clock position. Additional features: date indication, the aperture of which is located at the 6 o’clock position and power reserve indicator, the indicator is located on the back side of the caliber. The watch presents on a black strap made of genuine alligator leather, equipped with a buckle in 18 carat white or red gold to match the case with the appropriate gold clasp. To buy the original Bovet Tourbillon Grande Date 5-Day Reversed watch is available through the authorized representatives of the company. 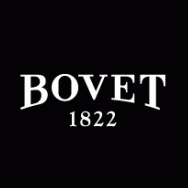 Official website of Bovet watches. Company Bovet presents to all lovers of fine watch making a truly amazing time meter - a new watch Amadeo ® Fleurier Tourbillon Virtuoso III. The owner of Bovet Mr. Pascal Raffy joined the Foundation's founder and director of APJ, winner of Oscar, Paul Haggis and supported the event APJ, which was attended by Jon Hamm, Kevin Jonas, Maria Bello, Vanessa Hudgens, Kate Beckinsale, Adrian Brody, Jimmy Jean-Louis, Rumer Willis and Omar Epps. Pocket watches - the revival of traditions! More watch companies draw inspiration from their past, as a result bringing to light pocket watches in a more modern manifestation. Striking example of this are pocket watches by Bovet, Bell & Ross and Chopard. Once again, the watchmakers have focused on the Chinese calendar. At this time, the watch company Bovet introduced its next watch creation - a new watch Amadeo Fleurier 43, dial of which is adorned with a symbol of 2014 year by the Chinese calendar – picture of horse. The famous Swiss watchmaker Bovet presents a new version of the model Dimier Récital 8, which is made at the Dimier 1738 Manufacture de Haute Horlogerie Artisanale. Deluxe model Bovet Rising Star Tourbillon has been successfully tested and certified by the Fleurier Quality Foundation. It has also been recognized as the most complex device, approved certification of the Fund for the twelve years of its existence. The world famous company Bovet has released a novelty Récital 9 Miss Alexandra Tourbillon. The famous Swiss watchmaker Bovet has announced the release of its model Récital July 10-Day Tourbillon, which was developed at the watch manufactory Dimier 1738. The famous Swiss watchmaker Bovet presents its new model - gorgeous women’s watch Récital 9 Tourbillon Miss Alexandra, designed at the manufacture Dimier 1738. The known company Bovet announces a new limited watch Virtuoso Tourbillon. Swiss company DKSH, which owns a controlling stake in Maurice Lacroix, has signed an agreement with the Swiss watchmaker Bovet. European Football Championship 2012 Cup, which takes place in Poland and Ukraine, was a success for the Spanish national team, reached the semifinals. In honor of the 190th anniversary the famous company Bovet has announced a new line of watches Amadeo Fleurier Rising Star, which consists of two models. On the occasion of its 80th anniversary the Italian brand Pininfarina, famous with its production of auto bodies and excellent car design, in 2010 began successfully to collaborate with the renowned Swiss company Bovet. Swiss watch company Bovet Fleurier presents a new model 5-Days Tourbillon Jumping Hours Reversed Hand Fitting. This watch can easily be transformed from the wrist watch to the pocket watch. This is possible thanks to the special design of the upper strap lugs.